If you buy fertilizer you will notice three numbers on the bag. These are the N-P-K levels in the fertilizer. The three numbers represent the levels of Nitrogen (N), Phosphorous (P) and Potassium (K) — in short N-P-K. These three elements are the primary necessary to have healthy growth in your garden plants. Chemical fertilizers are generally much higher in these numbers than Organic fertilizers, but organic fertilizers offer so much more without the risks of chemical fertilizers. There is a little known rule of science that governs the fertility of your garden soil. It is called “The Law of the Minimums” and is attributed to Justus von Liebig (1803-1873), a German chemist who made great contributions to the science of plant nutrition and soil fertility. Liebig’s “Law” states that yield is proportional to the amount of the most limited nutrient, whichever nutrient it may be. In other words, if one of the essential plant nutrients is deficient, plant growth will be poor even when all other essential nutrients are abundant so that your soil is only as rich as the minimum of any of the primary elements. So, you say, I don’t have time to get a degree in agriculture science, how can I enrich my soil without worrying about those concerns? First — a soil test! Your local ag extension agent (and they are everywhere) will provide free soil sample tests! Now is a good time to do that, since you still have time to address any deficiencies before Spring planting season arrives. Just contact them or stop by their office and pick up a free soil test kit and instructions. Alternately, you can purchase devices that will test for N-P-K and also pH, which dictates how available nutrients in your soil will be to your plants. Ideal pH varies, according to the plant variety. Acid loving plants like blueberries and potatoes, love lower pH levels, while sugar beets prefer a “sweet” soil, or pH around 7. Most crops fall somewhere in between — 5.5 – 6.5pH. It is best to check, since neglecting to do so could result in your wondering why your blueberries are failing in the limed soil that you created last fall. Or why the leaf mulch you dug in so lusciously to your 4 x 4 bed is now producing a puny bean or corn crop. Most importantly, use organic fertilizers! Organic fertilizers are minimally (or not at all) processed, and the nutrients remain bound up in their natural forms, rather than being extracted and refined. Organic fertilizers like manure, compost, bone/blood/cottonseed meal, feathers, leaves and other yard waste (as long as it has no sign of disease) are readily available often for free if you are willing to clean out a horse stall or rake some leaves. There are many advantages to using organic fertilizers. As they break down, organic fertilizers actually improve soil tilth (structure of the soil) which improves water and nutrient retention. Unlike chemical fertilizers, it is almost impossible to over-fertilize slow-releasing organic fertilizers, which means also that you will not be building up chemicals and salts in the soil that can kill your plants. Organic fertilizers will LOVE your garden and surrounding environment. They are biodegradable and a renewable resource! 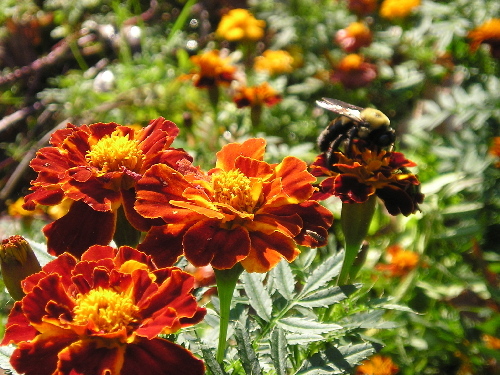 And they will not harm beneficial insects — especially pollinators such as honeybees! So please, do your garden and the environment a favor — use organic fertilizers! There are so many sources. Start a compost pile for your kitchen scraps. I once had a friend who went to the circus every Spring for elephant dung — and his garden was amazing! But you can find wonderful organic fertilizers now on the shelves at your local gardening center. Your garden will thank you and the world will thank you!